Children’s toys and child care articles containing certain phthalates are prohibited. One example of a product that may contain phthalates is a children's rubber duck. 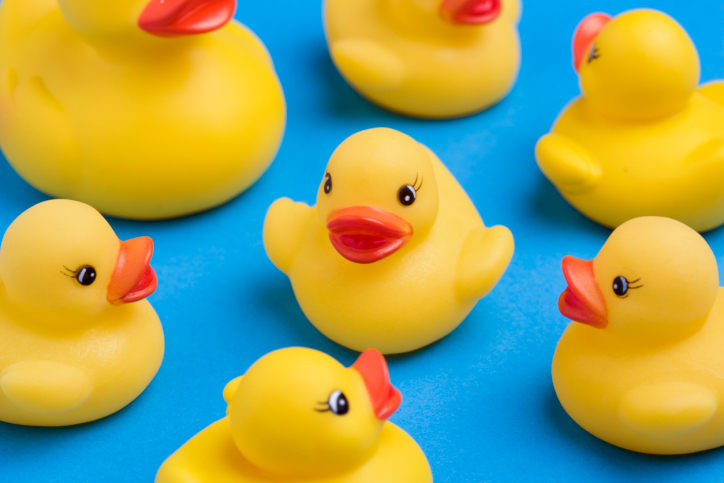 The flexible plastic feel of the rubber duck may be the result of using phthalates in the manufacturing process. This page provides information for businesses seeking guidance on how to comply with the federal restrictions for children’s toys and child care articles containing phthalates. Phthalates are chemical plasticizers that are often used in the production of many types of plastics. Phthalates, most often, but not always, are used to make plastics softer and/or more pliable. What is the prohibition concerning phthalates? In the Consumer Product Safety Improvement Act of 2008 (CPSIA), Congress permanently prohibited children’s toys or child care articles containing concentrations of more than 0.1 percent of three types of phthalates: di-(2-ethylhexyl) phthalate (DEHP); dibutyl phthalate (DBP); or, benzyl butyl phthalate (BBP). (Computed for each phthalate individually.) A child care article is a consumer product that is designed or intended by the manufacturer to facilitate sleep or the feeding of children age 3 and younger, or to help children age 3 and younger with sucking or teething. The CPSIA also established an interim prohibition on children’s toys that can be placed in a child’s mouth or child care articles that contain concentrations of more than 0.1 percent of diisononyl phthalate (DINP), diisodecyl phthalate (DIDP), or di-n-octyl phthalate (DNOP), The interim prohibition concerning DINP, DIDP, and DNOP remains in effect until the Commission’s final phthalates rule (16 CFR part 1307) takes effect on April 25, 2018, for all covered products manufactured or imported on or after that date, as directed by the CPSIA. On October 27, 2017, the Commission issued a final phthalates rule (16 CFR part 1307) with an effective date of April 25, 2018. The final phthalates rule makes permanent the interim prohibition on children’s toys that can be placed in a child’s mouth and child care articles that contain concentrations of more than 0.1 percent of DINP. The phthalates rule extends this prohibition to cover all children’s toys and child care articles containing concentrations of more than 0.1 percent of DINP. The phthalates rule also lifts the interim prohibitions on children’s toys that can be placed in a child’s mouth and child care articles that contain concentrations of more than 0.1 percent of DNOP or DIDP. In addition, the phthalates rule prohibits children’s toys and child care articles that contain concentrations of more than 0.1 percent of diisobutyl phthalate (DIBP), Di-n-pentyl phthalate (DPENP), di-n-hexyl phthalate (DHEXP), and dicyclohexyl phthalate (DCHP). The rule applies to products manufactured or imported on or after April 25, 2018. The definitions of “children's toys” and “child care articles” are discussed below. Please read the discussion below concerning component parts and inaccessibility to understand how the prohibition may apply to your product. You can learn more about the Commission’s decision by visiting the Federal Register final rule posting dated October 27, 2017, here. Where can I find the law describing the prohibition concerning phthalates? The law that prohibits children's toys and child care articles that contain certain phthalates can be found in section 108 of the Consumer Product Safety Improvement Act of 2008 (CPSIA) (pdf), Pub. L. No. 110-314, 122 Stat. 3016 (August 14, 2008), as amended by Section 5 of Public Law No. 112-28 (August 12, 2011). See also 15 U.S.C. 2057c. As explained above, the Commission published its final rule concerning phthalates in October 2017, 82 Fed. Reg. 49938 (16 CFR part 1307). The rule applies to products manufactured or imported on or after April 25, 2018. The Commission also voted to reduce the phthalate testing burden associated with seven (7) plastics with specific additives (discussed below) in August 2017, 82 FR 41163 (16 CFR part 1308). This burden reduction rule became effective on September 29, 2017, and was revised on January 26, 2018, 83 FR 3583. May a manufacturer make a children's toy or child care article that contains a phthalate or an alternative plasticizer that is not prohibited? The CPSIA permanently prohibited children’s toys and child care articles containing concentrations of more than 0.1 percent of DEHP, DBP, and BBP. In addition, as of April 25, 2018, the Commission has permanently prohibited children’s toys and child care articles containing concentrations of more than 0.1 percent of DINP (converting Congress’ interim prohibition to a permanent prohibition), DIBP, DPENP, DHEXP, and DCHP. A phthalate or an alternative plasticizer that is not one of the prohibited phthalates listed above may be used in a children's toy or child care article. Manufacturers are still responsible for ensuring that children's products do not contain "hazardous substances," as defined in the Federal Hazardous Substances Act (FHSA). It is the manufacturer's obligation to ensure that any alternative plasticizer used is adequately tested and the manufacturer must be confident that the product does not pose a risk of injury or illness under normal use or reasonably foreseeable misuse. Children's products that are or contain a hazardous substance are automatically banned. The Commission has issued chronic hazard guidelines to assist manufacturers in complying with the requirements of the FHSA. What children's toys are covered by the prohibition concerning phthalates? For the purposes of the prohibition concerning phthalates, a "children's toy" is a "consumer product designed or intended by the manufacturer for a child 12 years of age or younger for use by the child when the child plays." Whether the intended use of the product is for play, including a label on the product if such statement is reasonable. Whether the product is represented in its packaging, display, promotion or advertising as appropriate for use by the ages specified. Whether the product is commonly recognized by consumers as being intended for use by a child of the ages specified. What child care articles are covered by the prohibition concerning phthalates? Covered child care articles are those that are designed or intended by the manufacturer for a child age 3 years old or younger to facilitate sleeping or feeding or to help the child in sucking or teething. The definition was provided by Congress in the CPSIA, and at this time, the Commission has not issued further interpretive guidance. However, CPSC staff has interpreted items such as children's sleepwear, infant and toddler bottles, sippy cups, utensils, bibs, pacifiers, and teethers to be child care articles covered by the prohibition on phthalates. CPSC staff determinations have not been approved by the Commission and the Commission may review and/or supersede the staff guidance and determinations. What component parts does the prohibition regarding phthalates apply to? Does it apply to inaccessible parts? The Commission has issued guidance on how to interpret "inaccessibility." You can find this guidance at 16 CFR Part 1199. For future updates on this topic and other regulatory issues that may affect you, we recommend that you sign up for the Small Business Ombudsman Updates email list. Does each component part of every children's toy and child care article need to be tested? No. The Commission has stated that it is unnecessary to test and certify materials that are known not to contain phthalates or to certify that phthalates are absent from materials that are known not to contain phthalates. Natural latex and mineral products. Additional examples of materials that do not require testing and certification include paper products (paper, paperboard, linerboard and medium, and pulp). See the Commission's Notice of Requirements and the Commission's draft guidance (pdf). Can I rely upon a supplier that certifies that its component parts comply with the ban on phthalates? Yes, provided that certain conditions are satisfied. First, not all children's products are required to be tested for phthalates – only children’s toys and child care articles. Also, see the question above on component parts and inaccessibility. Second, the Commission issued a rule regarding testing component parts. To the extent that a children's toy or child care article is required to be third party tested for phthalates, you can rely upon the test results or a certification from a component part supplier if the requirements in our regulation at 16 CFR part 1109 are met. That rule requires that to rely upon test results or a certification from a supplier, you must use due care to ensure that the tests results or the certificate is valid and be given access to the underlying documentation, such as test results and attestations regarding how the testing was conducted and by whom. Generally, certifications of a component part must satisfy the requirement for a children's product certificate, and must be based on the results of testing from a laboratory whose accreditation has been accepted by the CPSC. Finally, see the question below regarding the Commission’s determination that certain plastics and additives do not require third party testing. For more information, please visit our Component Part Testing page. Is third party testing and certification required for the prohibition on phthalates? Manufacturers, importers, and private labelers of children's toys and child care articles must comply with the prohibition on children’s toys and child care articles containing certain phthalates by testing their products at a CPSC-accepted laboratory. Third party testing is required for all plasticized component parts in a children's toy or child care article, but is not required for certain materials known not to contain phthalates. Third party testing is also not required for inaccessible component parts of a children's toy or child care article, or products made of the following seven (7) plastics with specified additives listed in 16 CFR §1308.2: polypropylene (PP), polyethylene (PE), high-impact polystyrene (HIPS), acrylonitrile butadiene styrene (ABS), general-purpose polystyrene (GPPS), medium-impact polystyrene (MIPS), and super-high-impact polystyrene (SHIPS). For products that require phthalates testing, the manufacturer, private labeler, or importer also must issue a Children's Product Certificate in which it certifies that the children's toy or child care article complies with the prohibition on phthalates. You can find sample Children’s Product Certificates by visiting www.cpsc.gov/cpc. Do all plasticized components found in children’s toys and child care articles need to be third party tested? You can read more about the Commission’s testing burden reduction determination by visiting the Federal Register posting here. What is the test method that the Commission has accepted for assessing compliance with the prohibition on children’s toys and child care articles containing certain phthalates? The Commission issued a revision to the Notice of Requirements for Prohibitions of Children's Toys and Child Care Articles Containing Specified Phthalates, effective April 25, 2018, which updates the existing test method to be consistent with the final phthalates rule (82 FR 49938; 16 CFR part 1307). The revised version of the test method, CPSC-CH-C1001-09.4 (2018) becomes effective on April 25, 2018, and replaces test method CPSC-CH-C1001-09.3 (2010). Laboratories seeking CPSC acceptance to the revised phthalates test method are required to update their accreditation scope. To allow CPSC-accepted laboratories adequate time to update their accreditation scope document to include the revised CPSC method CPSC-CH-C1001-09.4 (2018), the CPSC will continue to accept testing results from laboratories that are CPSC-accepted to CPSC-CH-C1001-09.3 (2010) until February 2, 2020. To find out more information on the revised test method, please see the Federal Register notice published on February 1, 2018. My product failed a laboratory test, but phthalates were not purposefully added. Why did it fail the test? A failed test could indicate contamination from a number of sources and requires a thorough assessment of the manufacturing and shipping processes. For example, contamination could arise from recycled plastics, poorly cleaned manufacturing equipment, or even alternative plasticizers that contain trace amounts of the prohibited phthalates. It is also possible that the test is a false positive. Lab testing errors could arise from confusion over plasticizer identification. Operators are reminded that test method CPSC-CH-C1001-09.4 calls for an extensive qualitative identification; this should include a retention time match and a mass spectrum match with a known standard material. Does the packaging for child care articles and children's toys need to comply with the prohibition on phthalates? Packaging is generally not intended for use by children when they play, given that most packaging is discarded and is not used or played with as a children's toy or child care article. However, if the packaging is intended to be reused, or used in conjunction with a child care article or with a children's toy while playing, such as a heavy-gauge reusable bag used to hold blocks, it would be subject to the prohibition on phthalates. Does the prohibition on phthalates apply to children's shoes or socks? Shoes and socks are not considered to be children's toys or child care articles. See the Office of the General Counsel’s advisory opinion. Does the prohibition on phthalates apply to items such as children's pool toys and beach balls? Children's pool toys, beach balls, blow-up rafts, and inner tubes designed or intended for children 12 years of age or younger would be considered children's toys. Those objects are used by children when playing in a swimming pool or at the beach. Therefore, they would be required to comply with the prohibition on phthalates. Does the prohibition on phthalates apply to mattresses? Vinyl- (or other plasticized material) covered mattresses/sleep surfaces that contain phthalates that are designed or intended by the manufacturer to facilitate sleep for children age 3 and younger, are considered accessible and would require testing to ensure compliance with the phthalates prohibition. These sleep surfaces are not considered inaccessible through the use of fabric coverings, including sheets and mattress pads. Page last updated April 25, 2018. 1di-(2-ethylhexyl) phthalate (DEHP), dibutyl phthalate (DBP), or benzyl butyl phthalate (BBP).